Today I decided to share a bit of me. Don’t ask me when I got the jewelry bug, I can’t remember that far back. My childhood was spent as the past century’s version of a couch potato, meaning with a book – a long series of books, to be fair. Terrible as it was for social life at the time, it did fuel a few interesting conversations later on. Those conversations were more or less consequence free, with some very special exceptions. One was a very dear friendship. With that person, still a friend although from far away, I had the best and longest conversations about books, music and life in general. One day, back from a trip to New York, this friend opened one little Pandora box for me: Elsa Peretti’s fluid, feminine, genius designs. I became the proud owner of her ball point pen for Tiffany&Co, the one with the curved elongated clip. Curious as I’ve always been, next time in London meant a few hours staring at Tiffany’s windows and absorbing the most I could of those designs, simple and day-to-day forms distilled to their purest essence, in the most brilliant way – feminine without frills. Always a sweater person, I never enjoyed my clothes to be spoiled by prongs in jewelry. Peretti’s polished rounded shapes were just meant for me. So, when time came to give birth to my first child (a boy now taller than me and enjoying it! ), I decided I wanted a solitaire pendant as a gift. But not just any … I wanted THE one. I was lucky. I became the (once again proud) owner of a beautiful Diamonds By the Yard solitaire pendant, in yellow gold because I am yellowish too. Life has its things and years later I remarried. Honeymoon involved a trip to the USA and, consequently, I got to spend some nice moments at the EP counter @ Tiffany. Result: the softest, roundest gold and diamond cross pendant, with me today as I write this. I don’t know how Elsa does it but the cross looks like it’s smiling all the time! I kind of enjoyed the rhythm: every few years, trip to NYC, go to Tiffany, bring back a bit of Elsa. And so it happened, a nice round birthday was coming about on one of those trips and – guess what – earrings this time! And then again, in Rome, the best Valentine’s Day ever got marked by a long pair of silver mesh earrings. Not the easiest to clean, I must say, but SO glamorous. Indeed, Elsa Peretti has been present at some of my important life moments. Because her aesthetics just mirror my own vision of life: less is always more, it allows you see the core – of people, of things. And it always benefits from a little sense of humor. I still miss the bone cuff so, Elsa, please go on. PS1 – I just discovered Elsa Peretti Design blog, a great quick “fix” for Peretti’s junkies. PS2 – While researching a bit for this post, I found out about the possibility of Elsa Peretti and Tiffany&Co parting ways… anybody knows how that came out? 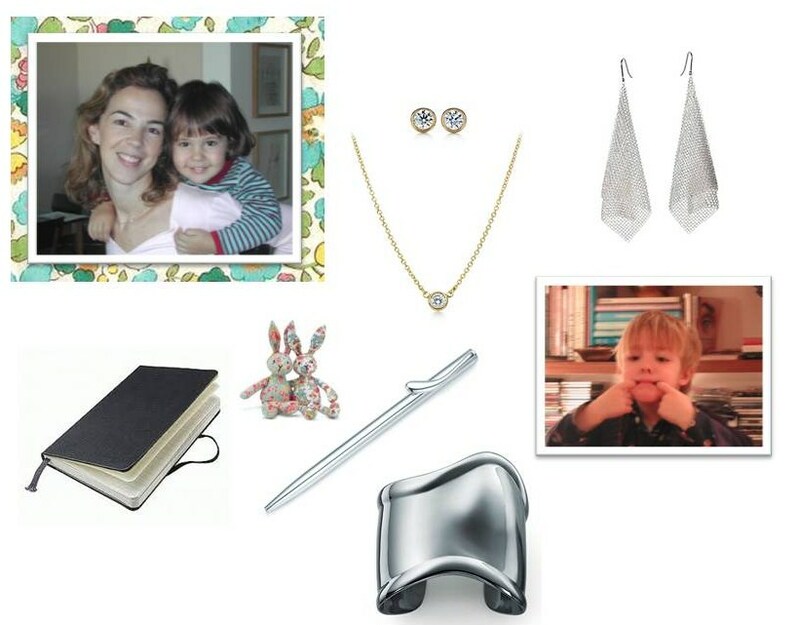 This entry was posted in Brands, Jewelry, Personal style and tagged Diamond solitaire, Diamonds by the Yard, earrings, Elsa Peretti, Jewelry, Silvia Taveira, Style, Tiffany, travel. Bookmark the permalink.